Selected music / Stuart Greenbaum. Book of departures : for flute, clarinet, percussion, piano, violin and cello / Stuart Greenbaum. Book of departures : for piano trio / Stuart Greenbaum. 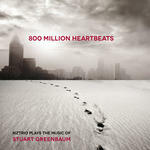 800 million heartbeats / NZTrio plays the music of Stuart Greenbaum. This work was originally commissioned in 2007 by Sydney's Sonic Art Ensemble as a sextet and was subsequently arranged for The Yarra Trio (piano, violin, cello) in 2008. Commission note: Commissioned by Sonic Art Ensemble with funds provided by Australia Council. First performance: by Sonic Art Ensemble, Marshall McGuire — 12 Aug 07. 29 Oct 2017: at Strelitzia Ensemble: Book of Departures (The Independent Theatre). Featuring Strelitzia Ensemble. 16 Sep 2017: at Book of Departures (Glebe Justice Centre). Featuring Strelitzia Ensemble. 12 Aug 07: featuring Sonic Art Ensemble, Marshall McGuire.